Bicycling is more popular than ever. A great form of exercise, recreation, and an alternative to consuming gas in your daily commute, more and more people are getting on their bikes and riding regularly. However, riding a bicycle can be more dangerous than driving a motor vehicle, and injuries from a bicycle accident can be devastating. When you ride your bike, you share the streets with vehicle drivers who may be negligent and are increasingly distracted by cell phones, texting, and laptops, making accidents more likely. Neglected or poorly maintained roads can cause a bike accident long before they become an issue for other vehicles. If you have been injured in a bike accident with a motor vehicle or due to a defective roadway, you need to talk with an experienced bicycle accident lawyer in Carlsbad. For a free legal consultation about your San Marcos, Carlsbad, Oceanside, Vista, or Escondido bicycle accident, contact the Rubinstein Law Group today to speak with an experienced Oceanside bicycle accident attorney. We know cycling is your passion, and not the practice of law. San Marcos personal injury lawyer Zev Rubinstein and his team of experienced lawyers and experts can guide you through the legal process so you can focus on overcoming your injuries and getting back to the sport you love. We have been helping bike accident victims receive just compensation for their injuries since 1988. Our bicycle accident lawyer in Carlsbad has represented cyclists at every level, from occasional riders to weekend warriors, iron men, even professional athletes, so we understand your injury and its potential impact on your life and your passion for the sport. When someone else’s negligence or misconduct is to blame for your bike accident, you deserve compensation for your injuries. But we know your bike accident caused more than financial harm therefore, our Oceanside bicycle accident lawyers work hard as your advocate to maximize the compensation you reserve and to aid in your physical and emotional recovery. The Rubinstein Law Group is a firm that truly understands the significance of your bicycle accident. Our personal injury attorneys in Vista have represented bicycle enthusiasts of all levels, from professional to recreational and we know the impact your bike accident injuries can have on your life. Although we are located in San Diego County, our firm represents clients from all over the state of California. We have assisted clients from heavily traveled areas where traffic congestion increases the rate of accidents. We represent injury victims of bike accidents that occurred along PCH in San Diego County, including Oceanside, Carlsbad, and cycling centers throughout Southern California. 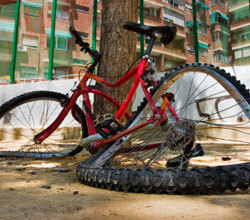 If your case needs an experienced bike accident attorney, we can come to you. Please call us at 760-804-2790 today or email us to schedule a free consultation with an experienced Carlsbad bike accident attorney today.